This tutorial will demonstrate how to use a combination of Normal Editor and Map Generation skills to draw a custom normal map for an existing texture map. Before starting you should ensure that you have at least ShaderMap version 3.0.3 installed. 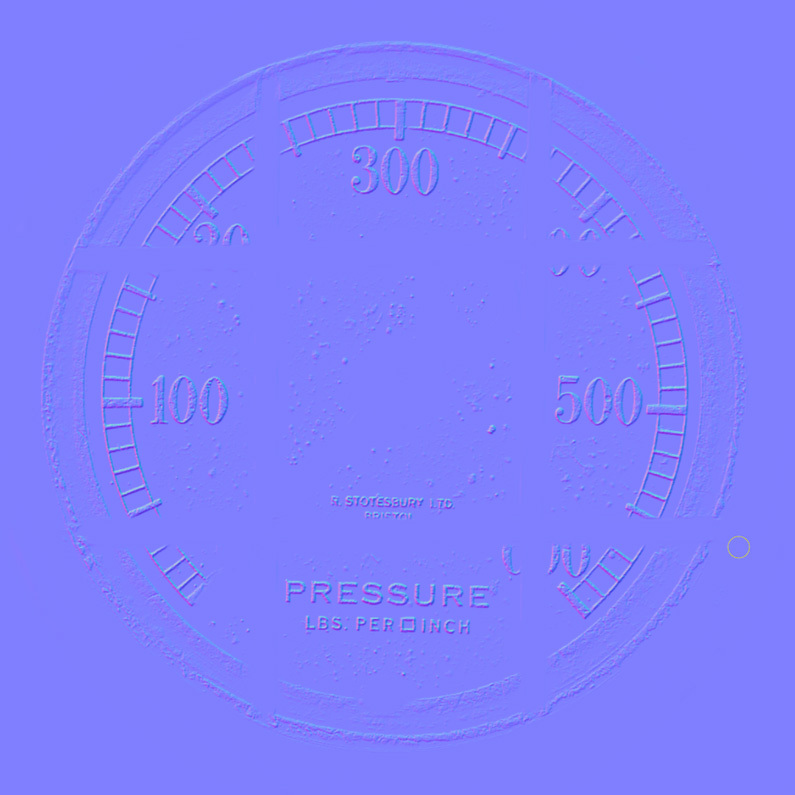 In this example we will be drawing a normal map for an analog pressure gauge. The link to the source texture and project files can be found at the bottom of this page. Open the ShaderMap application. From the Start screen, click the Advanced Setup button (bottom-right of the window). This will take you to an empty project and display the Add Node dialog. Select Source: Color Texture then load the Gauge Texture image file. Once the texture is loaded you will see a thumbnail image of it in the Project Grid. Save the project to file, name it Gauge_Normals or Meter_Normals. We are going to create a normal map that is the same size as the original source texture. In this step we will first create a displacement map from the diffuse texture, isolate the outer ring with a gray-scale mask, then generate a normal map from the displacement map. Move your mouse over the empty Project Grid cell below the source texture thumbnail. Click the + (plus) button to bring up the Add Node dialog. Select Map: Displacement ( Diff ) to add a displacement map (from diffuse) to the Project Grid. Once the map is added a displacement map is generated from the diffuse texture. The default settings for the displacement map will do just fine. 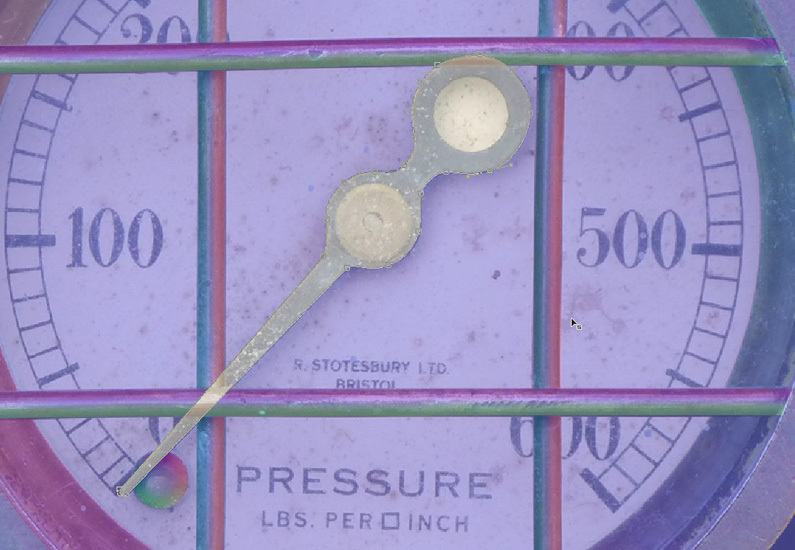 We want to isolate the outer ring of the gauge so we can generate normals just for that part of the map. Select the displacement map in the Project Grid and in the Map Properties section, click the Load Mask button. Locate and find the black & white mask image file (download with the project below). Move your mouse over the empty Project Grid cell to the right of the displacement map, click the + (plus) button and add Map: Normal ( Disp ). 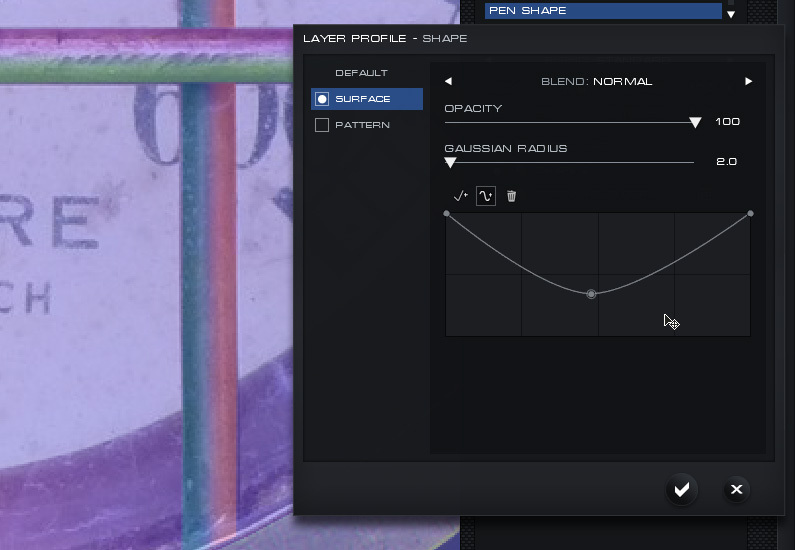 Once added, select the normal map and ensure the normal map’s source input is on the displacement map. You can left mouse drag-and-drop the source marker to any map that isn’t logically impossible. Add the map mask to the normal map just as you did with the displacement map. This will help tighten up the edges of the normals. Go to the Material Visualizer (Press M on the keyboard). Select Geo: Dynamic Plane under the main Visualizer window. Bring out the Material Editor (arrow on the right of the window) if it isn’t already out. Move your mouse over an empty cell in the Material Grid, click the + (plus) button then select Standard from the list. Setup the Diffuse Map and the Normal Map by clicking the “M” button located next to each one on the Material Setup dialog. Press Enter to exit the dialog. Left mouse drag-and-drop the material onto the Dynamic Plane geometry. You are now setup to view changes as they are made to the normal map. * Remember to save your project from time-to-time. Select the normal map in the Project Grid. All normal maps can be sent to the Normal Editor by clicking the “N” button in the node controls (right side of thumbnail). Click the “N” button now. 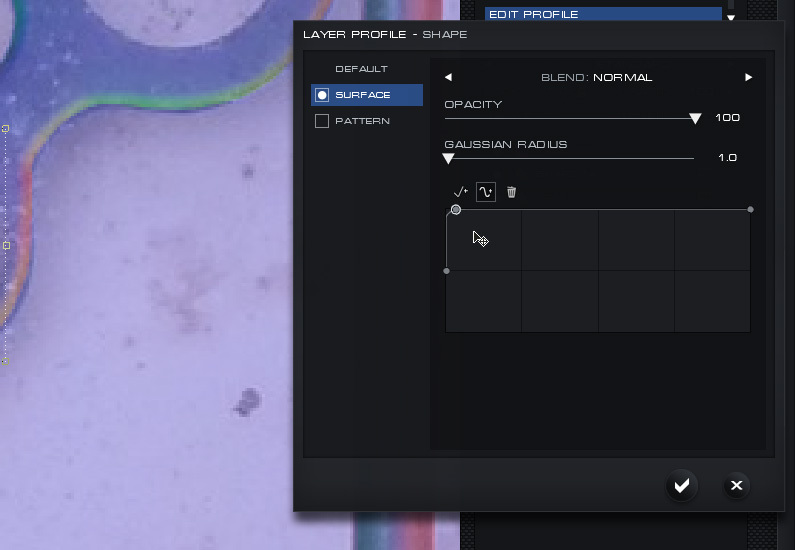 The normal map is displayed in the Normal Editor interface. At the bottom left of the Normal Editor preview window you will see an “M” button. This button allows you to setup an overlay image to be rendered on top of the normal map. Press “M” and select the original source texture from the popup dialog. You can now adjust the opacity of the overlay and toggle it with the check box. 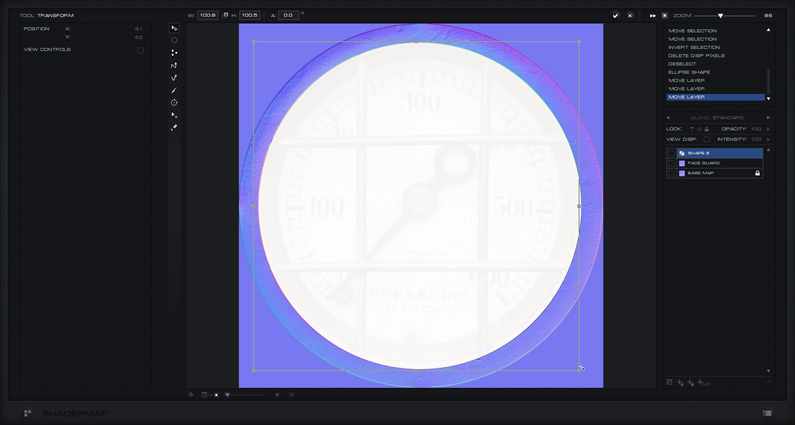 Ensure the overlay is on and set with an opacity of 50%. Select the Shape Tool in the toolbar. 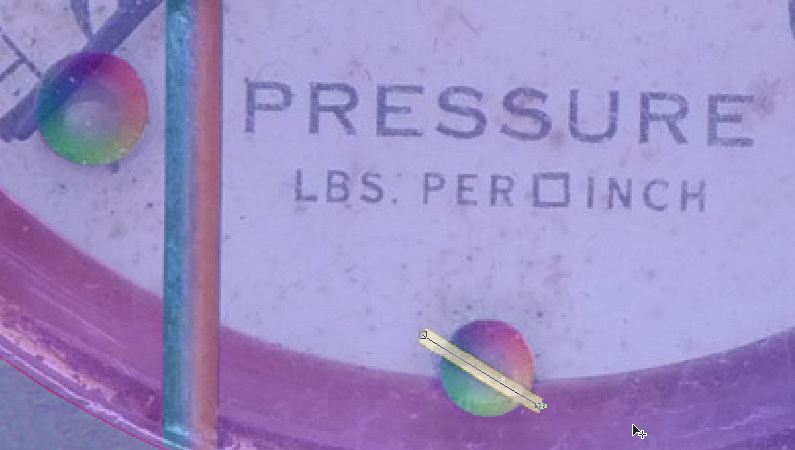 In the Tool Properties select Pen and enable line with a width of 28 pixels. Draw the left vertical bar by first clicking above it then below it so the line shape extends onto the outer ring (we will crop this later). You should now have a line shape layer with flat normals, it may be hard to see. Select the Shape Edit Tool in the toolbar then click on the line shape to edit it. You can use the Shape Edit Tool to add and delete knots from the shape as well as move existing knots and knot weights. Now do the same for the remaining three bars. If you make a mistake simply undo the action by selecting an event in the History Control list or by using the keyboard shortcut Ctrl+Z. The next step is to crop the bar shape pixels to the edge of the outer ring. Select all four of the bar shapes. Select the top shape layer in the Layer Control, press and hold the Shift Key, then select the bottom layer. You can also use the Transform tool to rectangle select the layers. Once they are all selected, right click any of them in the Layer Control and select Merge to Normals. This will convert all of the Shape layers to Rasterized Normals while combining them into a single layer. We do this so that individual pixels can be deleted from layer which is not possible on Shape layers. Double click the merged layer name to rename it Face Guard. Choose the Select Tool from the toolbar. 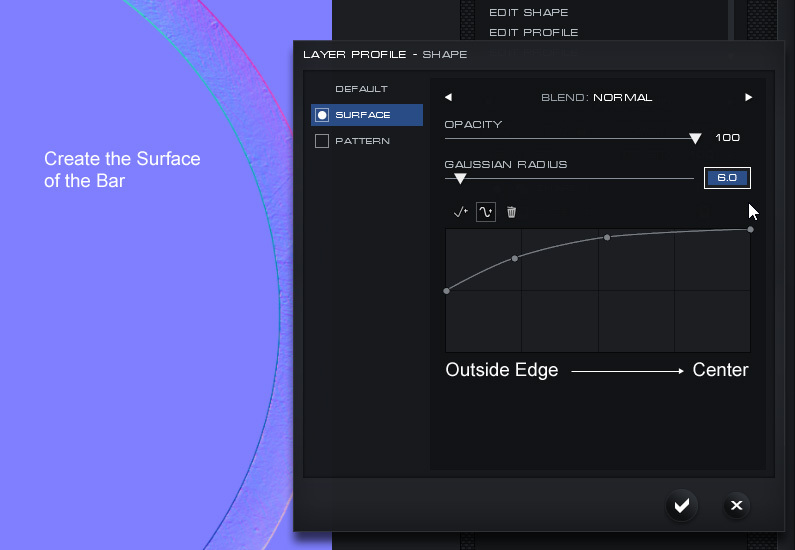 In the Tool Properties panel select Ellipse shape and ensure Anti-Alias is enabled. 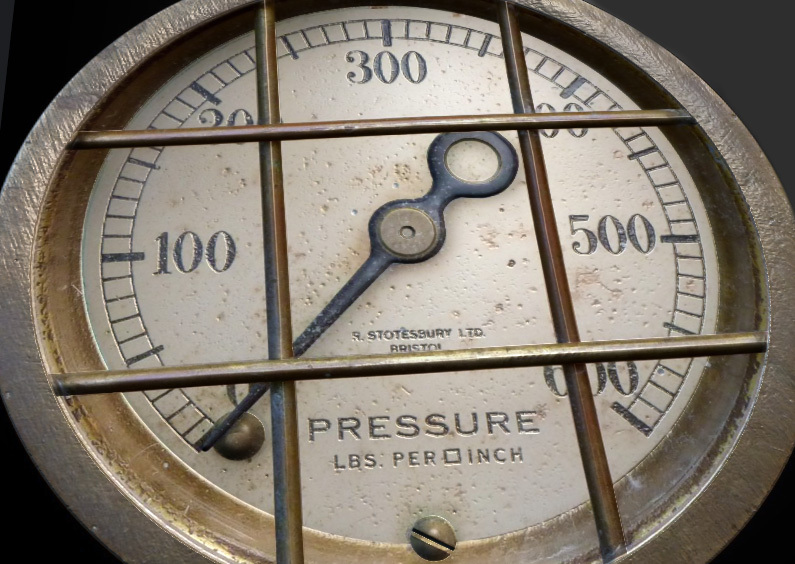 Use the selection tool to create a selection that fits inside the gauge’s outer ring. Once you are happy with the selection use the keyboard shortcut Ctrl + Shift + I to invert the selection. 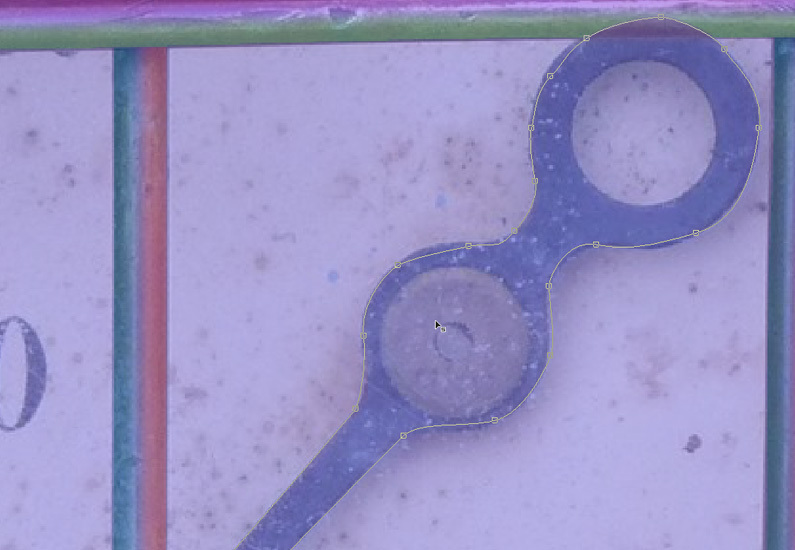 On the inside of the outer ring begins a section of metal that descends towards the face of the gauge. We are going to create the normals for this section using an Ellipse Shape and a Surface Profile. Select the Shape Tool on the toolbar and ensure it is set to draw an Ellipse shape type that is not a line (solid shape). 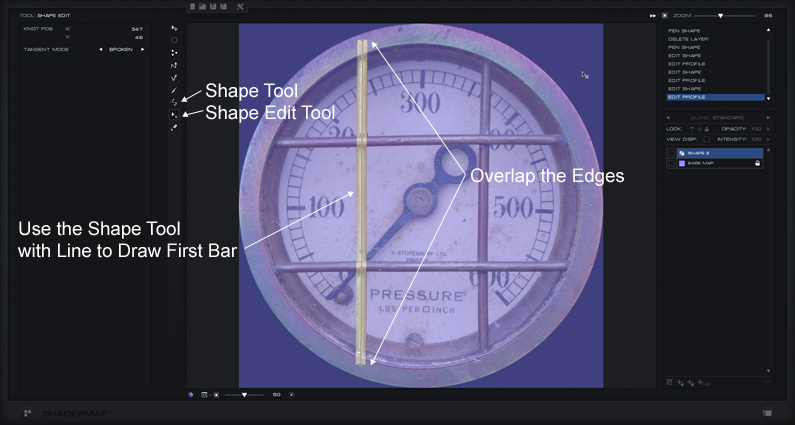 Draw an ellipse Shape Layer that covers the inside of the gauge. Use the Transform Tool to scale it to fit. 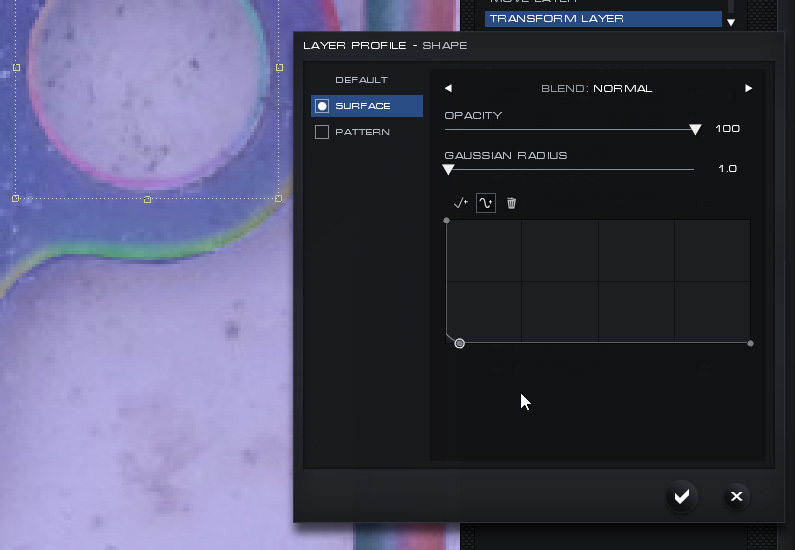 Select the layer in the Layer Control and open the Profile dialog. Add a surface profile that descends linearly as shown below. Use a bit of Gaussian Blur to get a smooth result. 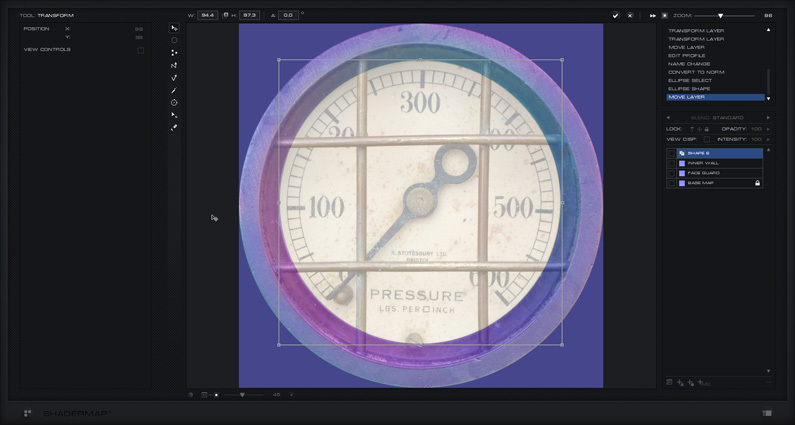 Use the Shape Ellipse Tool to draw an ellipse Shape Layer over the previously created layer and fitting perfectly over the face of the gauge. Use the Transform Tool to make adjustments. This layer is simply to give flat normals to the inside of the face and create sharp edges on the previously created normals. Merge the layers to Normals and rename the layer Inner Wall. Right click the layer in the Layer Control. Select Duplicate Layer from the context menu. Drag the duplicated layer over to the left screw head and use the Transform Tool to fit it to the pixels. The next step is draw the groove in the bottom screw. Use the Shape Tool with Pen shape and line enabled with a width of 8-9 pixels. Draw a line across screw head to match the slot in the texture. Ensure the line is extended beyond the head as shown. Convert the groove layer to Normals by right clicking the layer and selecting Convert to Normals. Rename the layer to Screw Groove. Next use the Select Tool to draw an ellipse over the bottom screw head, invert the selection then delete the pixels that extend over the edges of the screw. Ensure that the layers are ordered correctly. If the groove is under the screw head it will not be visible. 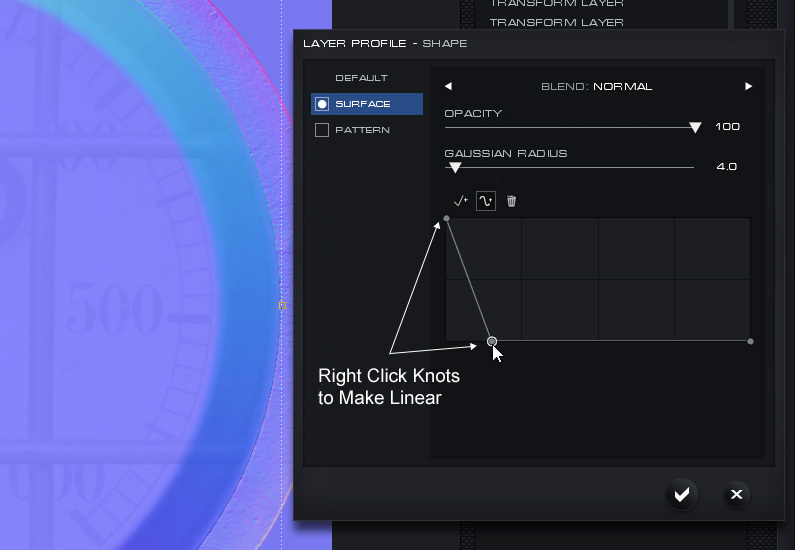 Drag layers up and down in the Layer Control to change their order. Use the E key at any time to bring up an external window with the Material Visualizer in it. This is good to do from time-to-time so that you can see exactly what your normals will look like when rendered in a 3D environment. Now to draw the gauge hand. To do this we will use the Shape Tool with Pen Shape and line disabled (solid shape). See below how the shape is supposed to look on a first attempt. The Shape Edit Tool is used to fine tune the shape afterwards. This might take you a few attempts. Start by making the first knot then on the second knot click then hold the mouse while dragging away from the knot. This will create a curve knot with control points, these can be modified later with the Shape Edit tool. Any knot can be linear or a curve. Knots can be configured with the Shape Edit tool by first selecting a knot then changing the knot settings in the Tool Properties. Rename the layer to be called Arm. The next step is to create a detail normal map. This will be used to give additional detail to the face of the gauge. Exit the Normal Editor by pressing the Main Interface button located at the bottom-right of the application window. You are now back to the Main Interface and should see the Project Grid just as you left it. 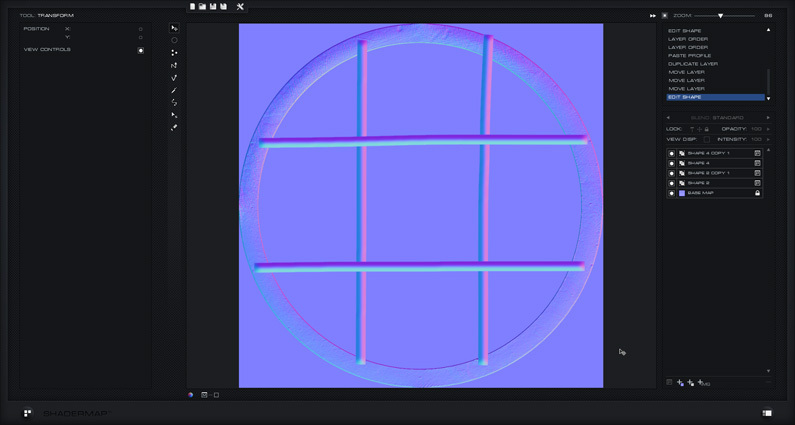 Add a new node Map: Specular ( Disp ). This will generate a detail specular map from a displacement map but we are going to use the source color texture as the input. 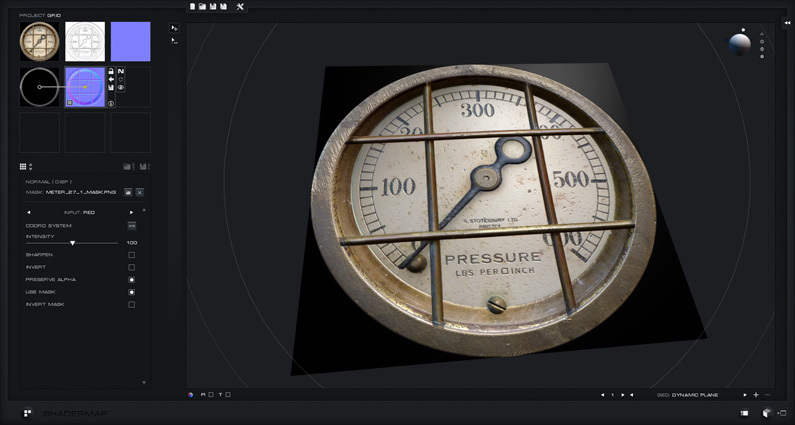 Once the Specular map is added select it then drag its input line to the original source color texture of the gauge. Next add another node Map: Normal ( Disp ). This will generate a normal map from displacement but we are going to use the generated specular map as the input. 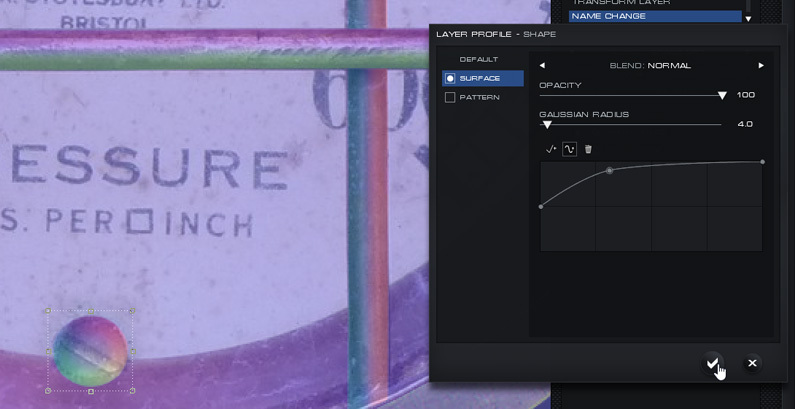 Once the Normal map is added select it then drag its input line to the previously created specular map. Set the intensity of the Normals to 10. You should still be in the Normal Editor with the painted detail normal map. Choose the Select Tool from the toolbar and ensure rectangle shape is chosen. 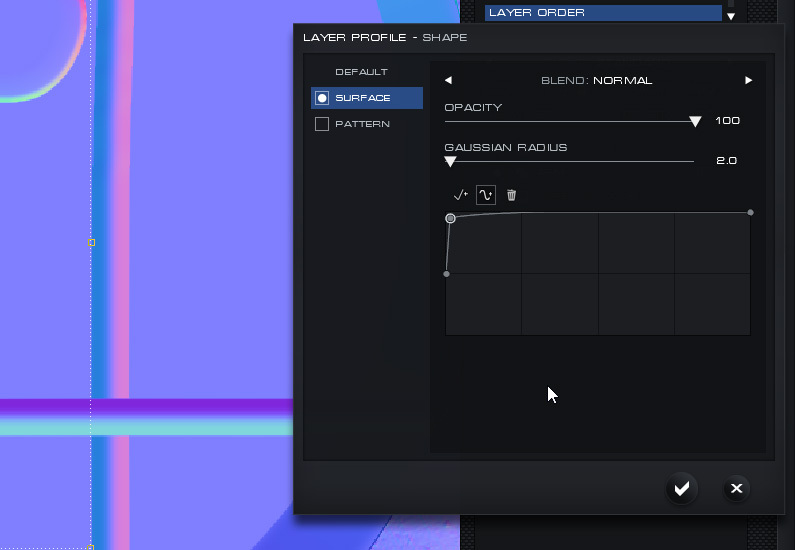 Select the base layer in the Layer Control. Use the keyboard shortcut Ctrl + A to select all pixels in the layer. Press Ctrl + C to copy the pixels to the clipboard. Now exit the Normal Editor and return to the Main Interface. 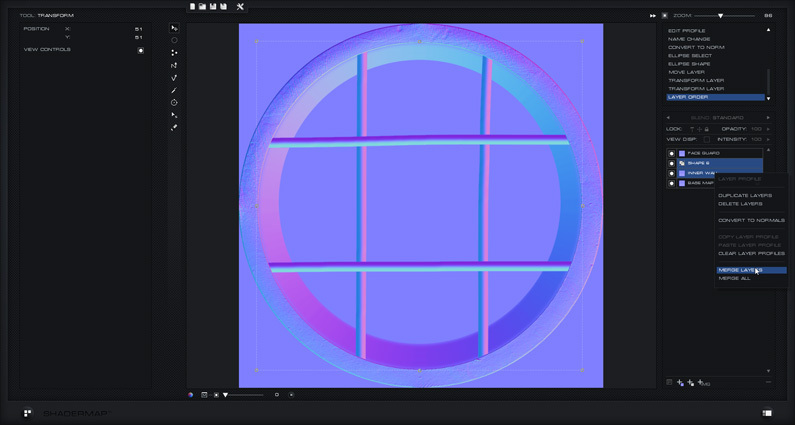 Select the other (main) Normal Map in the Project Grid and send it to the Normal Editor. Press Ctrl + V to paste the copied layer pixels as a new layer. Rename the layer to Detail. 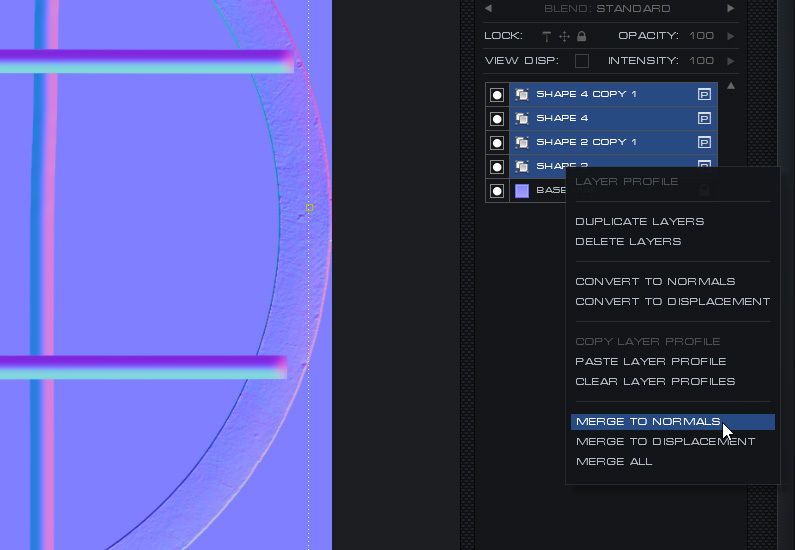 Order (drag) the layer in the Layer Control to be just above the Base Map right near the bottom. 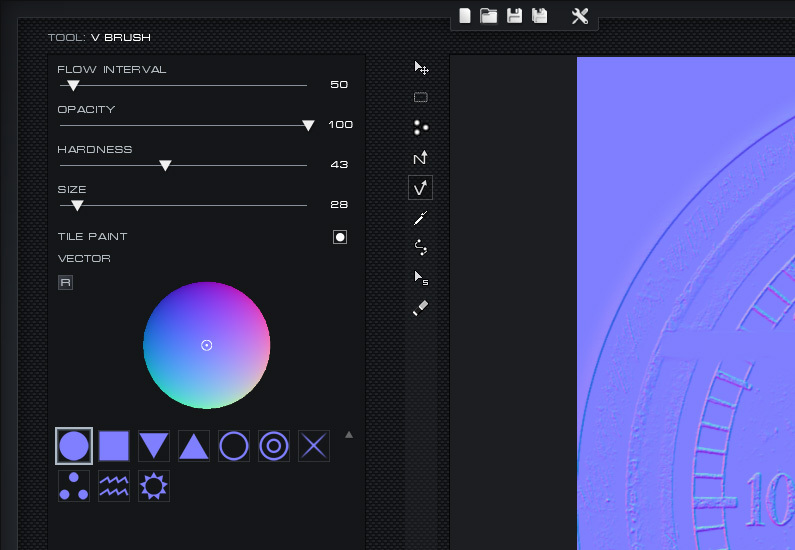 Next select the Detail layer and set the Blend Mode to UDN. You can also adjust the intensity of the Detail layer normals to around 50% which will give a nicer result. Exit back to the Main Interface and see the results in the Material Visualizer. 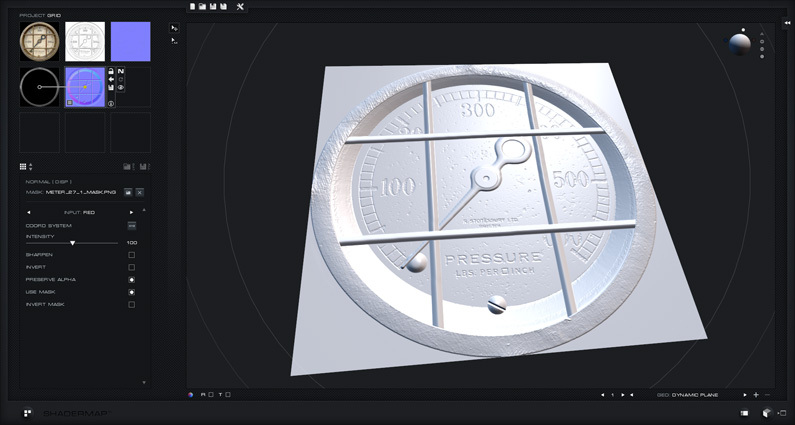 Try moving the white light in the Visualizer scene to see how light plays off the surface of the gauge normals. 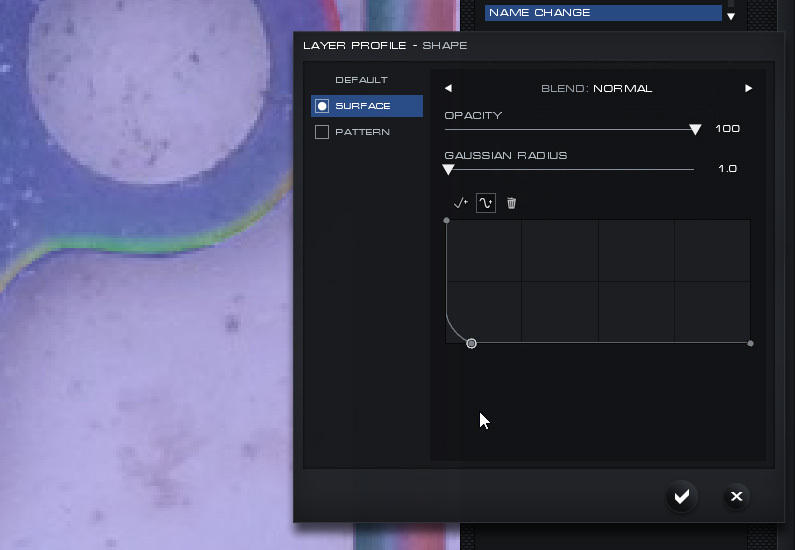 Disable the diffuse map in the Standard Material to display only normals.